Here are three of seven ways to gain extra safety and profit with your investments and savings. 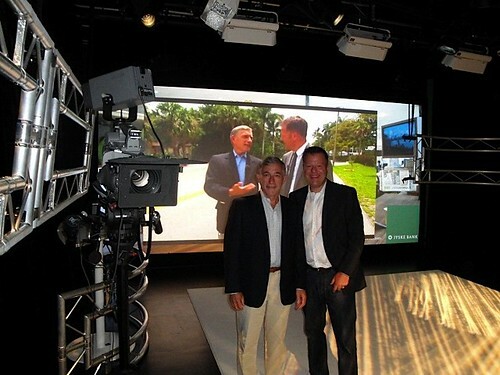 Gary Scott & Thomas Fischer at Jyske TV station. We work together regularly to find ways to diversify for safety and profit. Recent messages “Economic Pitfalls Lurking” and “Depositors Multi Currency Revenge” and “‘Seven Ways to More Safety & Profit” have been examining seven ways to gain extra income to fight inflation and protect purchasing power. The first three are a high interest paying multi currency spread that pays 7.12% per annum composed of Australian dollars, Brazilian real, Chilean peso, Hungarian forint, Russian ruble, Indonesian rupee and South Korean Won. The second is to speculate on the Australian dollar. The third is to invest in a commodity currency ETF. Here is an examination of the fourth, fifth and sixth ways to invest globally for more safety and profit. Safety & Profit Ideas #4: Invest in a non leveraged Jyske Global Asset Medium Risk Portfolio. You gain currency, regional and asset class diversification with daily management. This portfolio has risen 5.81% already this year. 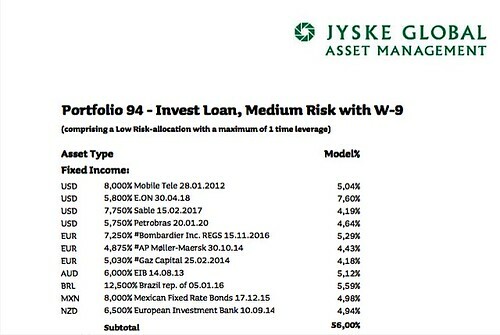 Safety & Profit Ideas #5: Invest in a leveraged Jyske Global Asset Medium Risk Portfolio. You gain currency, regional and asset class diversification with daily management and extra profit potential. 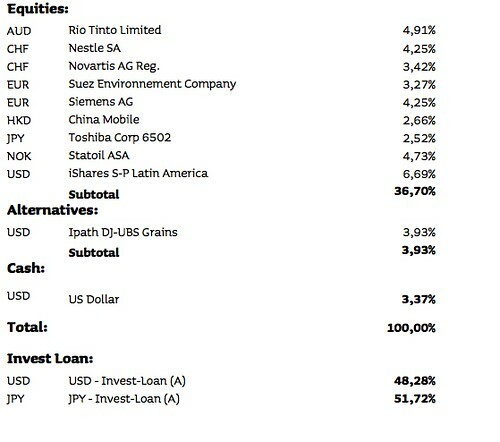 Plus this portfolio has not risen as much this year (3.72% versus 5.81% for the non leveraged portfolio) because it is leveraged in part with Japanese yen loans. This increases risk, but also profit potential if you believe the yen will fall. Safety & Profit Ideas #6: Invest in a Jyske Global Asset Managed Forex Account. Currency volatility is bad for most investors… but creates good news for currency traders. Jyske is among the most experienced currency traders in the world and its higher risk managed forex account is already up 10% this year. JGAM does not take a huge number of positions and does not trade short term technicalities. Instead they look for flaws of currency fundamentals. For example below are the three postions JGAM held in April 2011. One was a long position in New Zealand dollars versus the US dollar. JGAM saw a distortion there and the results have been dramatic… a 17% rise in just two months as shown in this graph from finance.yahoo.com Australia. 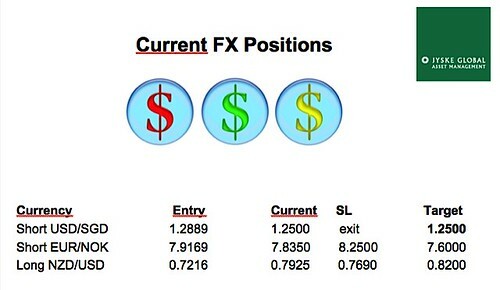 The other benefit of forex trading is that it is totally uncorrelated to equity and fixed income markets. Usually when stocks rise, bonds fall and vice versa. Currently there are risks in both sectors. Forex investments are not connected so whatever happens to stocks and bonds… currency markets move along on their own. Thus what is often viewed as a risky investment can actually add stability to a portfolio. These 4th, 5th and 6th ways are easy ways to diversify globally for safety and profit with the help of one of the most experienced international banks in Europe. The seventh way to gain added safety and profit is to create a micro business that allows you to be where you choose… and earn…perhaps even more than the banker. There is a universal value that comes with the ability to serve. This is a reality that has never changed… and never will. The ability of the small business to serve effectively is enhanced by modern technology. We can help you create your own micro business in numerous ways. Join Merri, me and Thomas Fischer next week. Learn more about all seven of these depositor’s revenge ideas at our June 24-26 International Investing & Business seminar in West Jefferson. We have just three places left for the seminar.